Until the 19th Century, when the Pfinz was still in the middle of the old town, existed between today Büchelberg Street and the Town Hall is a ford to cross the river. On the occasion of severe flooding in 1824, the brand is still read at the Town Hall, thoughts began to build a bridge. They should serve to ease transport, especially for the heavily laden carts, and the brick version of the riverbed should fix the banks against flooding. The realization was still waiting for some time to yourself. Discussions on the exact location and lack of funds aggravated the situation. The costs were calculated high because not only the bridge but also the enclosure to protect the underlying mill (see, Table 3) and the lowering of the town hall trench into account (channel in the picture above in the bridge wall visible) had. At a town meeting in March 1840, the construction of a stone bridge was decided. After accurate determination of its size and location they started with the 3-jochigen massive sandstone bridge on 13 July of that year. 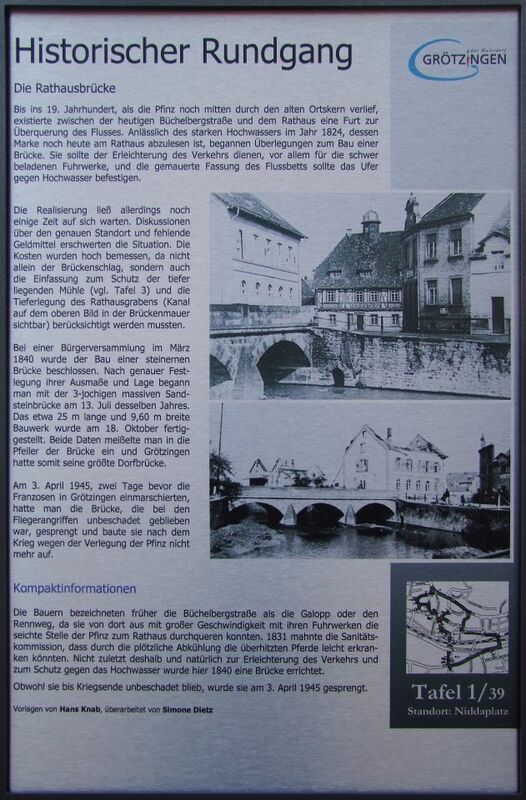 The approximately 25 m wide and 9.60 m long building was on 18 Completed in October, both dates are carved into the pillars of the bridge and thus had its greatest Grötzingen their bridge.